This animated series was made from a novel that I quite enjoy to be relaxing and fun to read while seeing food that is made and served in this series! It's enjoyable and it would be fun to watch and enjoy if you are looking for something to relax with! I really enjoy the manga and this seems like a solid beat for beat remake. But it's hard to feel like you're relaxing in an izakaya when there's text constantly crowding out the screen. Do we really need a banner at the top telling us which episode it is? How about giant bubble text at the bottom to emphasize what the characters are saying? It probably looked fine in the original Japanese airing but throw subtitles on top of all of it and it's a convoluted mess. Did the publisher only have Japanese-localized files on hand and didn't have any raws? It definitely doesn't feel like they had foreign audiences in mind. The animation quality seems pretty good. Everything is drawn well and looks appetizing, and I was impressed when I first saw condensation running down a mug. They definitely put in some effort here. I have mixed feelings about the cooking segments at the end. They're interesting and well done, that's for sure, but it's obvious it costs us full-length episodes. The run-time is really surprising -- just 15 minutes altogether, including the cooking show. You're looking at a 30 second intro, a nine and a half minute episode, a three and a half minute cooking show, and a one and a half minute credits roll. It's quality content but MAN is it short. a food show that's actually informative! I usually never write reviews because I tend to agree with the overall ratings on here, but I was shocked to see such a low rating for this show. I wouldn't say that it's the best show ever made out there, but it certainly doesn't deserve a low rating! 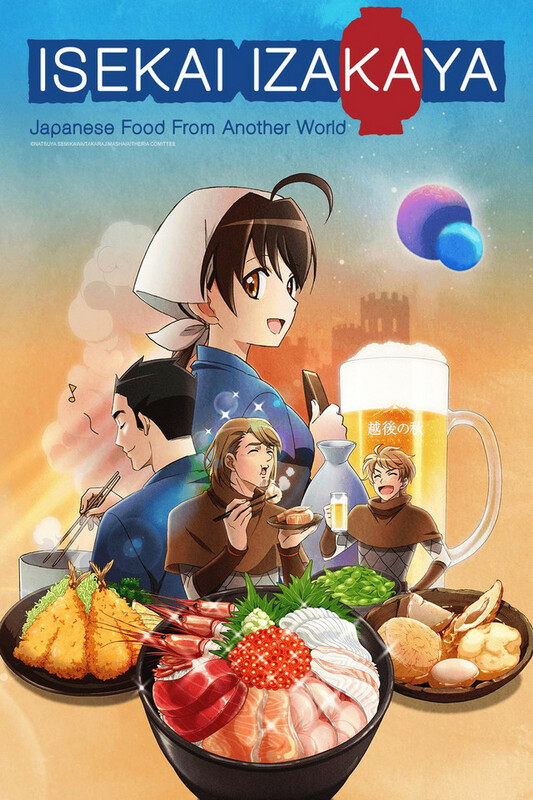 As someone who loves working with food as well as wants to know more about all the japanese food showcased in anime series, this is the series that I have been looking for! if you are someone that not only enjoys food anime but wants to learn more about japan and its food, you will definitely love it. I LOVE THIS ANIME and I don't care what people say because my boyfriend heavily judged me for enjoying this too much. I understand Shokugeki had given everyone a standard of what Japanese food in anime should look like, but this show was so absolutely entertaining in its own quirky way that you just have to watch it and understand why. I also liked seeing the previews of real life food a the end of each episode. I wanted to cry when the show ended so soon. Everything! I reminisced about my trip to Japan every time I'd see the food come out. I HAVE NO CONS. IM BIASED AND IN LOVE WITH THIS ANIME. SO ANGRY IN A PASSIONATE FOOD ADDICTION. I am actively reading the novel and manga, and I can say, this anime adaptation is a disappointment; for two reasons. One, the pointless banner at the top throughout the episode. I don't ever recall seeing other shows using such a bad idea. It flat out breaks immersion, which would be one of this shows selling points. Two, on the topic of immersion, while the cooking segment at the end is interesting, this reduces the amount of time that could be spent on plot. In case you viewers didn't know, compared to Restaurant to Another World, this story is actually more plot focused as opposed to episodic. Thus, it had the potential to be immersive for a foodie isekai story. Overall, I was expecting a story/foodie anime, but got what almost looked like an infomercial. What was Sunrise thinking when they produced this anime like this? That being said, it great otherwise, thus it still manages to get a 3 stars out of me despite the glaring faults. I'm two episodes in, and so far this show feels as if it was the child of Restaurant to Another World and Wakakozake (both of which I recommend to people who enjoy this series). There's something about watching a show about delicious food, and watching people discover it and enjoy it that is strangely relaxing and satisfying. Disclaimer: I have yet to read the manga. I found this show to be thoroughly satisfying to enjoy especially while snacking/drinking/having a meal. 10 mins of anime followed by roughly 3-4 mins of real life cooking tips show or hunt for specific food places which both feature that episode's special dish. This anime is very informative and helpful to food and cooking enthusiasts. what beer goes with this is just some of the things they talk about. It has a great story line and you can really cook everything from the show. I myself have cooked some of the item on the show it on my youtube check my username on their it the same. I really hope that it comes back with another season it so great and it just getting started. If there is an anime that cares about viewers, there will be viewers that care about the anime. When I started coming to Nobu, there were banners all over the place. The banners annoyed many of the other customers and were quickly taken down. Nobu reminded me about a favorite hideaway of mine called Nekoya, so at first I thought that Nobuyuki was just serving cheaply made knock-offs, but a little searching revealed that Nobu was founded long before the restaurant to another world. I came every week after that. I drank at Nobu to remember, while others drank to forget all of the dark moments this season. Each patron had a story, each story had an effect. The world turned for all of us but Shinobu was still there. Here's to the most under-rated anime of the season.